For less than a year Bulgaria changed two minister of foreign affairs. 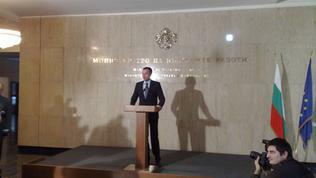 The new first diplomat Nikolay Mladenov who replaced the failed as a Commissioner-designate and as a foreign minister Rumyana Zheleva, has been voted today by the National Assembly and was to present his priorities for the journalist who, en masse, waited for him in the Ministry of Foreign Affairs. Unfortunately, he had to do this in 10 minutes because he was to fly urgently for London for the International conference on Afghanistan which starts tomorrow. By his little words we understood that there will be no unexpected movements in our foreign policy. Instead, the new foreign minister will stake on greater inter-institutional cooperation, especially with regard to the ministries of defence and of the economy and energy. Very strong were his first words which show the difficult task he is facing given the situation Bulgaria is in currently: "I am convinced that a foreign policy cannot be successful unless the internal policy is a success. This is an old principle in diplomacy and I am confident that so as the work of this ministry could be successful we will have to attract resources and capacity from all other ministries. 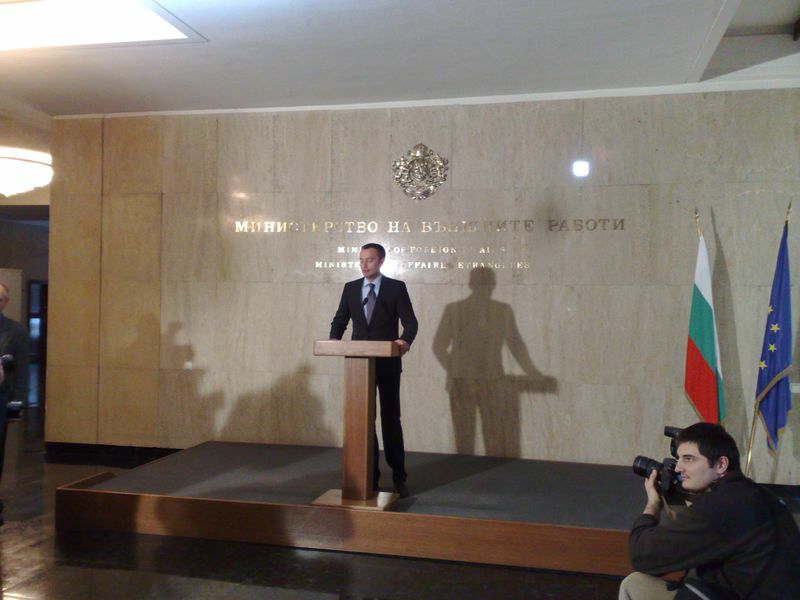 First of all those are, of course, the Ministry of Defence, the Ministry of Economy, Energy, Tourism, the ministries which are engaged with all the tools that help Bulgaria protect its interests, the interests of its citizens and to create opportunities for the success of Bulgarian economy abroad". This statement practically means that Mr Mladenov intends to increase the requirements of the European Affairs Council which is comprised of experts and representatives from all ministries that develop Bulgaria's positions in the EU. The Council is presided by the deputy foreign minister Konstantin Dimitrov and is part of the structure of the Council of Ministers. The Council has been established with Bulgaria's EU accession in 2007 but until last year its sessions were closed and there were almost no briefings. The former deputy foreign minister Krasimir Kostov made the sessions open for media thus giving journalists the possibility to follow directly which ministry on what issue and with how long is in delay from the agenda, approved each year by Parliament. Krasimir Kostov resigned in the end of 2009 because of revelations for his relations to the former State Security of communist Bulgaria. Since Konstantin Dimitrov took over after him, the sessions of the Council were again closed and the briefings were also canceled. Another accent in the short statement of Nikolay Mladenov was that Bulgarian foreign policy would focus on the region, specifically - South Eastern Europe. Nikolay Mladenov is among the young members of the government - he was born in 1972 but he started his political career early. He graduated in international relations from the University for National and World Economy but he also has a master degree of martial science from the Royal College in London. He was a member of Parliament between 2001 and 2005 and as such he was a deputy chairman of the parliamentary Committee for European Integration and a member of the Foreign Affairs and Defence Committee. He was also Bulgarian Parliament's representative in the Convent which developed the European Constitution, rejected in referenda in France and the Netherlands. From 2007 until 2009 he was a member of the European Parliament and as such he as a member of the Foreign Affairs Committee and the Security and Defence sub-Committee. He was also an elections observer in Albania, Bosnia and Herzegovina, Ukraine, Pakistan and Ghana where he headed the Observers' mission of the EU. Before joining the ruling party GERB he was a member of the Union of Democratic Forces where he was also a spokesman during Nadezhda Neynsky's presidency. The new minister will have the difficult task to put foreign policy in order which started to get shape under Ivaylo Kalfin who was first diplomat in the previous government but for the 6 months Rumyana Zheleva as a head of Bulgaria's diplomacy, there was no movement in this field. No less challenging would be the formation of our priorities against the background of the EU now having an enhanced position of a high representative for foreign policy and security - Catherine Ashton.